Hosted by klaatu on 2018-08-02 is flagged as Clean and is released under a CC-BY-SA license. Clacke mentioned SparkleShare in episode 2542, and it occurred to me that not everyone knows what Sparkleshare is. So here's a show about it. To setup SparkleShare, refer to SparkleShare.org. It's available for Linux, Windows, and Mac; great for cross-platform collaboration. The Linux installer uses FlatPak, so you do need to install that. The first screen asks for your name and email. This doesn't have to be your real name and email, but it is what SparkleShare will use when making commits on your behalf. This name and email will be visible to anyone who can see your online Git repository. The next screen displays the Sync Remote Project screen. You use this screen any time you want to add another share to your sparkle. In this episode, I set up two projects: one brand new one using my home server as host, and one that mirrors an existing project on Gitlab.com. The first thing you must do is give SparkleShare permission to access Gitlab. To do this, click on the SparkleShare icon in your system tray > SparkleShare > Client ID and copy your ID to your clipboard. Now go to your online Git host and add this "Client ID" to your approved SSH Keys. 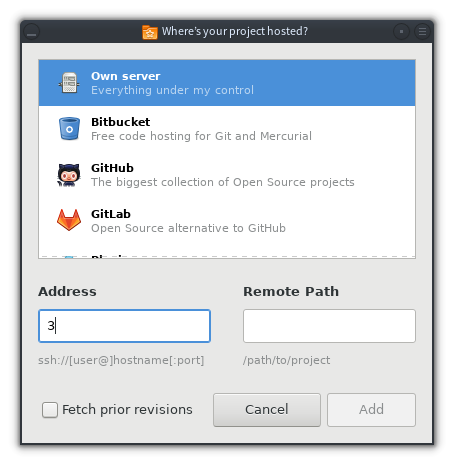 Where this is located depends on your Git host, but in Gitlab, it's located in the left column of the Settings screen. When your SSH Key has been added, Gitlab displays a key fingerprint (actually just a string of numbers) as confirmation. Click the Add button to add the project to your local SparkleShare folder. Is your local .ssh/config file setting some "invisible" defaults for when you SSH to your server? If so, you may need to modify or add an entry for SparkleShare. Is your SparkleShare SSH key (the "Client ID" in SparkleShare lingo) in your authorized_hosts file? Does a Git repository exist on your remote server in the location you think it exists? Use SparkleShare exactly as you would DropBox or the NextCloud Desktop Client: drag-and-drop a file to add it, drag it to the Trash to delete it. All SparkleShare folders sync'd with any given project syncs automatically through the magickalfulness of Git hooks. Excellent show as always! What SparkleShare is and how to use it at different expert levels, and when not to use it at all, is all thoroughly explained without the episide ever feeling long. But most of all, thank you for paying off my episode debt to the community for me. I guess I owe you personally an episode now instead.